If you are picking someone up at Bradley, take advantage of our free Cell Phone Waiting Lot. This parking lot allows you to wait in the comfort of your car until your arriving passenger(s) have left the aircraft, collected their luggage and called you to be picked up at curbside. Please note that waiting is not allowed curbside or at the arrivals pick-up area at the terminal. The Cell Phone Waiting Lot eliminates the need for circling at the Airport repeatedly if an arriving party is arriving later than expected. 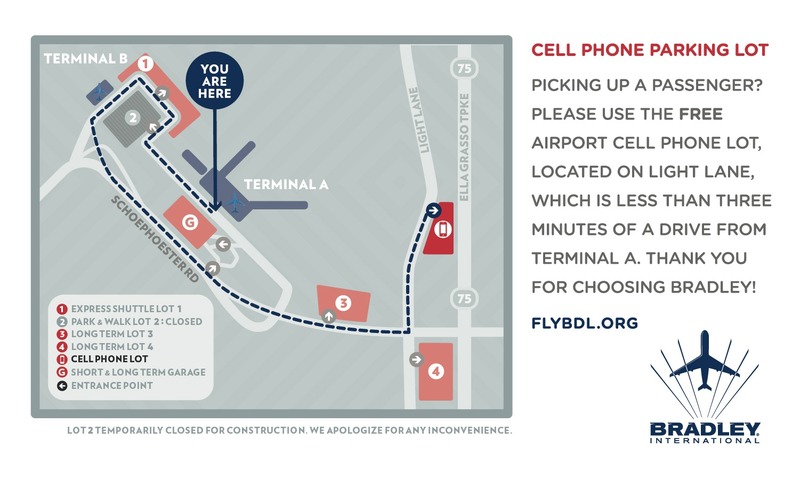 The Cell Phone Parking Lot is conveniently located on Light Lane, only minutes from the terminal and is easily accessible. For Google directions, please click this link. We now have 2 electric vehicle charging stations located in the Cell Phone Parking Lot.